Challenge #37 - "Sharing recipes!" Can't say it enough but . . . WOW . . WOW . . WOW . . what a really creative bunch you all are and many thanks from each and everyone on the DT for sharing your FAB projects with us each week . . . we are "blown over". Please can we also say an apology if we haven't yet visitied you to comment on your great card or project . . we are working our way through all the entries and promise to visit everyone. A further "thank you" is needed to be said to everyone who voted in our poll last week and the large majority winner was "Inlinkz" as the preferred method , so we will be using this system again this week. Now onto the prize "thingy" and the lucky winner of last weeks challenge . . chosen by MrsRandom.Org is . . . Many congratulations from everyone here and please could you email Jennifer from CraftBrulee directly to claim your prize. Please put "Fab'n'Funky" prize winner in to the subject line. We haven't had this sort of challenge for a long while, so we thought . . "hey, why not!" . . so everyone grab your aprons and other parafanalia as we have a yummy, easy to cook recipe for you all to follow . .
See it wasn't that hard and if you're stuck for an idea, have a sneak peek at some of the sketch challenge blogs out there for some inspiration. Now the DT weren't at all stuck and have used the "F'n'F" recipe to "cook up" some FAB project for you all . 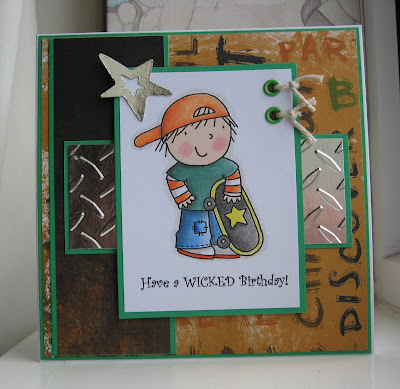 . . . .
No card from Jenny this week as she is away on holiday this week (lucky girl). Well we'll let you go now and can't wait to see what delicious-ness you cook up this week following our simple recipe! Challenge # 36 - "Flower Power"
Oh my. oh my what a great number of entries last week and we were simply blown away by all your projects. It was fab looking at all the different types of colour blends people used . . . it's great for all of us to get inspiration by looking at the projects on "show". You should all definitely give yourselves a HUGE "pat on the back" for all sharing ideas and tips. Now onto this week . 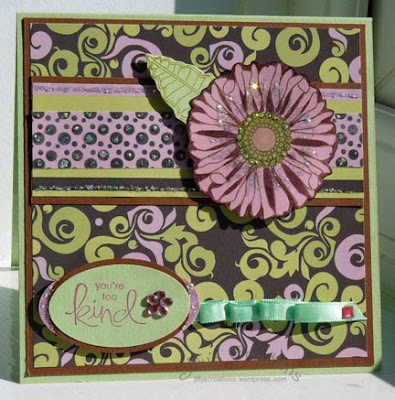 . . well, we are very lucky this week to sponsored by a great embellishment designer and our theme this week has been fitted in with the gorgeous flowers (plus other items) that Jennifer sells. Click on the blinkie below to be taken to the Craft Brulee shop. 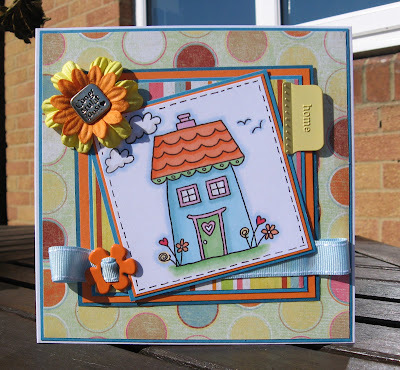 In the meanwhile, pop over to Jennifers blog and check out the completely AWESOME altered birdhouse she has made . . this project really shows you how to use your embellishments and ribbons to their full potential. 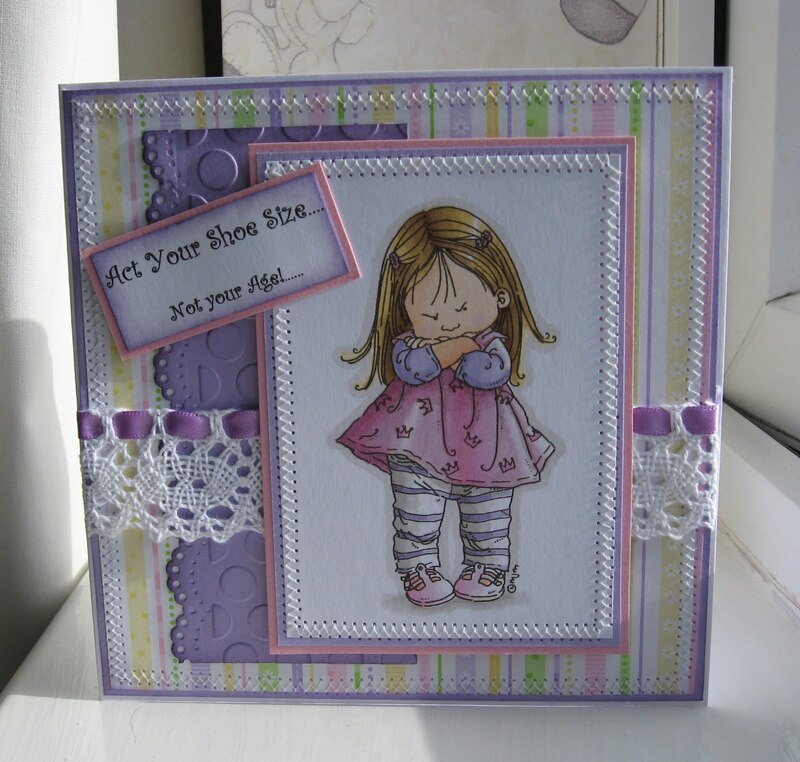 The lucky randomly chosen winner of this weeks challenge will receive this stunning prize . .
Is that simply yummy and scrummy prize?Many thanks again Jennifer for sponsoring us and if you want to get your craft mitts on this prize all you need to do is create a project with this weeks theme . 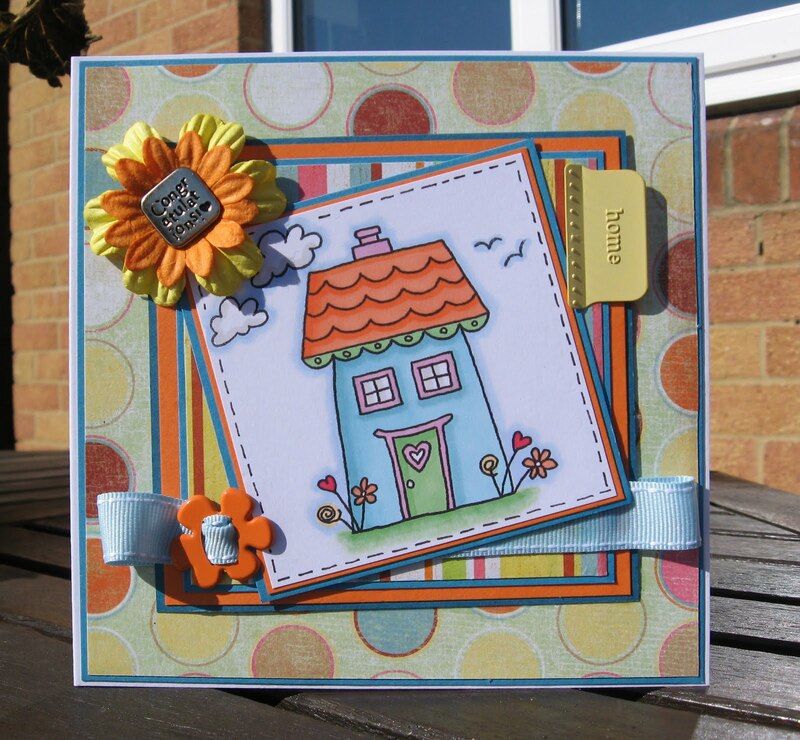 . .
We would like to see flowers on your projects / cards this week and you will get 2 entries into the draw for this weeks challenge if you make your own flower embellishments too . . ! Now the DT have been "flowering" all their projects this week and here are their ideas . . .
Have a great week everyone and can't wait to see how you interpreted this weeks challenge. We've trying a different "link system" this week. Please where possible, turn off your word verification. The DT love to visit you all but it can take an age to leave a comment if you have word verification . . . why not try comment moderation instead. The Inlink2 will ask you to link directly to your project and not your blog, that way we can leave our "lurve" for this weeks challenge. Now which link system do you prefer to use? There is a poll under all the DT links at the top of the page and we would appreciate if you could take the time to vote. This way we make sure we are using the most user friendly link system for each challenge . . . thank you. Challenge #35 - "Simply Colour-rific"
WOW . 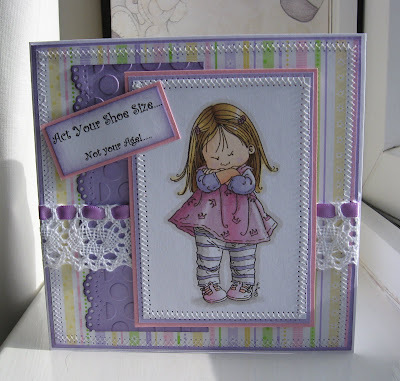 . . we were all smitten with your "dots, spots and stripes" from last weeks challenge. You should give yourselves a big pat on the back for all your FAB projects. The lucky winner of the Gift Voucher from Softpencil is . . . (chosen by Random.Org) . . . Many congrats from everyone on the DT and please email Elizabeth directly to claim your prize. It would help Elizabeth if you wrote "Fab'n'Funky Challenge Winner" in the subject line too. This weeks challenge is going to be left to you a little as the DT have decided to be a little nosy this week . . . hee, hee, hee . . . and we have chosen the theme . .
One of the main reasons we chose the theme is that sometimes we "play it safe" with our colour blends and it's great to see what you guys and girls mix together . . . from soft pastels to the boldest brights . . . so let the fun begin ! As always the DT have some inspiration to kick start the challenge and without further ado, here they are . . .
We've also remembered Mr Linky again this week . . . hee, hee, hee! That's 2 weeks on the trot folks . . we're on a roll! Please where possible, turn off your word verification. The DT love to visit you all but it can take an age to leave a comment if you have word verification . . . why not try comment moderation instead. Please could you also link directly to your project and not your blog, so that we can leave our "lurve" for this weeks challenge with you. Many thanks to you all for joining in with last weeks challenge and as always there was brilliant "eye candy" to behold. There was also one or two techniques that will definitely have to be attempted in forth coming challenges ! ! Now the DT chose to use Master Random.Org this week as he hasn't chosen for a long while (!) and the lucky winner of the Some Odd Girl voucher is . . . Please email Kirsty directly to claim your prize and please remember to put "Fab'n'Funky Challenge Winner" in the subject line. From all the DT, congrats on wining such a fab prize. Now as it's the start of a brand new month, this means that this weeks sponsor is . .
To win a fab voucher from Softpencil, all you need to do is enter this weeks challenge which is simply called . . .
"Let's get spotty, dotty and stretchy stripes!" To start the challenge rolling, here's what the DT with this weeks theme and many of us have used Elizabeth's gorgeous digi images too . 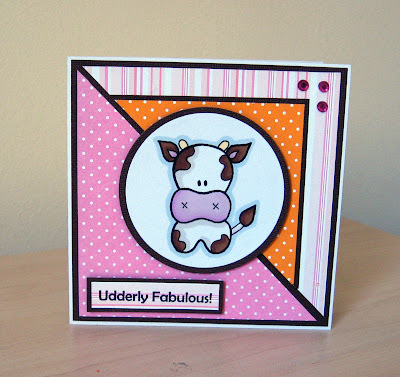 . .
Have a great week everyone and we can't wait to see all your "spotty, dotty and stretchy stripes" ! No 18+ unprintable entries though ! We've also remembered Mr Linky again this week . . . hee, hee, hee ! Please where possible, turn off your word verification. The DT love to visit you all but it can take an age to leave a comment if you have word verification . . . why not try comment moderation instead.